CAREER BOARD GOES HIGH TECH!!! The E-Career tool has been developed to facilitate communication between employers and potential employees prior to the 2010 ADSA ASAS AMPA CSAS PSAJoint Annual Meeting, making it easier to arrange contact in Denver. If you are an employer that needs to fill a Graduate Student position, or a position, in academics, research, industry, etc., simply use the “Employer Entrance” tab and enter all relevant information. The tool is free to use and very user friendly. Also, take advantage of the “search employee” function to identify potential candidates and see where/when they will be presenting their work. If you are a potential employee looking for a position in the aforementioned fields, simply use the “Employee Entrance” tab and enter relevant information, upload your CV, cover letter, or anything else you feel will help you get the position you are seeking. Again, this tool is very user friendly and free to use. You can also browse and search positions that have been posted by employers. Be sure to enter the time(s) of your platform or poster presentation(s) so potential employers can see your work. For both groups, be sure to enter contact information including how to get in contact at the Joint Annual Meeting. ASAS is excited to bring this new feature to Joint Annual Meeting Attendees and hope you take full advantage of the E-Career Tool! See you in Montreal! 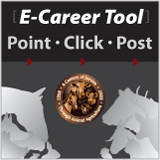 Use the E-Career tool today!